Autumn has arrived with its cold wet grey days and early evenings so it's time to present some decks that fit the feeling one gets from all this time of the year. The The Lost Tarot Cards by British artist Dominic Murphy positions itself at the darker side of the autumn/end of summer spectrum (and although Halloween is still a month away this deck would be perfect for that) , no surprise knowing that the artist describes the inspiration to become a painter (seeing Bacon's portrait of pope Innocent) as "Francis Bacon ruined my life"
Murphy a prolific artist who also created some card decks before has now turned his attention to the tarot, his extended tarot deck (the majors plus 'lost cards' of the artist own imagination) is executed in his own style that I'd call dark surrealism and shows the art of a schooled accomplished artist. Showcasing lot's of sculls, alchemical & occult symbology and grim/severe facial expressions this is not a deck made to make you smile or feel better, but one of those deck that feel magical and bizarre in a 'good way'. This 36 cards edition (the artist still works on some more cards, not a 78 but rather a 54 cards deck, in the same structure as now 22 majors + extra cards) was only printed in a very limited edition of 10 because 2 cards: The devil card and the Hesperus card where misprinted, namely with a to small white border. Update: o coincidence the same day I post about this version of the deck the artist starts selling his completed deck on his eBay store! Rejoice tarot collectors of all nations, Adam McLean, fellow collector of tarot (with a truelly HUGE) collection has restarted to produce limited edition tarot decks in his Artwork Tarots, after his project was stopped because of the theft of the Intellectual Property rights by scrupulous people sharing these free on internet thus making it unprofitable for Adam to continue the project. 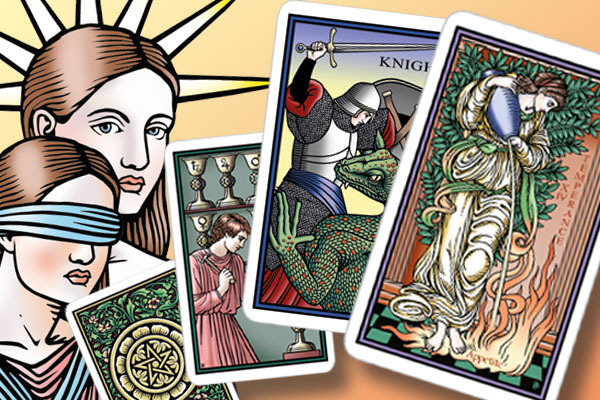 Earlier this year he started experimenting with the new high quality printer and discovered a way to produce very good quality tarot cards in a way that is both more cost effective and faster than before, resulting in the fact he can now sell them at half the price of his earlier editions. Other changes he made are that he no longer prints card backs, has reduced the size of the editions from 100 to only 50 and finally the customized boxes are replaced by clear plastic ones. This all will result in the fact that editions will sell out very faster and be followed by new ones, and based on how successful this edition was he is considering putting out more decks. Indeed I wrote "was" because deck number 24 in the Artwork Tarots series the "The Fialko Tarot" by American artist and singer Jeff Fialko (hence the name) is already sold out, and it has only taken a bit over a week to do so, speaking of a succes, this is one! You can see some more of the deck at Adam's page about it...sadly that is all no more decks for sale. I admit it I have e nerdy, geeky or whatever you want to call it side,I love sci-fi (both books, movies, as...whatever) so when I found a deck that combines my passion for tarot with my sci-fi love I just had to grab it! Originally designed only to be featured upon T-shirts but the demand upon the artist for a 'real printed deck' became that big he finally went along t make one - something I've been very happy about! All the characters in the deck have been replaces by those wonderful 'living machines' who are portrayed in a wide array of shapes and poses,so to fit best the 'role' they are playing. All are executed in a style I'd call retro Science Fiction (remember those old posters from the '40ies, 50ies and 60?) and each one of the 23 majors (yes 23, the artist created 3 versions of the Fool, each as funny as the other, it would have been, a shame not to see them) and 56 minors is produced within a limited pallet up to maximum 4 I think which accentuates the retro elements while giving the image a strong and solid feel. For some the unillustrated pip cards might be a downside but with such a deck rich in colour these do have a soothing effect upon the eye, just enough to be ready for the courts. An other aspect that keeps the theme up to the very last (or very beginning as you open the parcel they come in) is the metal tin they come in an that's held together with a metal strap, nice touch and wraps the whole up very well. You can find the tshirts, prints and deck (in 2 sizes) at the artists Etsy shop, and on the tarots Facebook page, and for those who want there is even a website (very creative man isn't he and really passionate about his art and the works it produces). 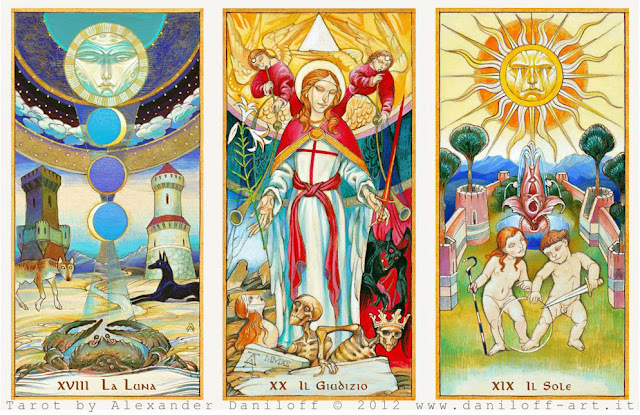 The second of May I posted about the impressive majors only deck created by Alexander Daniloff, tarot he was still working upon finishing a minor arcana at the time. Now a few months later the finished version is almost reaching the point where it can be printed, Mr. Daniloff expects it for this autumn, some of these finished cards can be seen at his website here . The cards are 78 pieces of stunning work of art, each one of them. As one can notice some of the majors underwent ‘some’ changes, a few differences are small other very noticeable, but every one of the new ‘versions’ look wonderful to me!! One thing that did not change between this and the majors only version is the way the artist uses color and contrast in a way that make the images come alive, vibrant with energy ready to pop of the paper and right in your face. The price and number of decks printed in this edition will off course depend upon how many people are interested in getting one (or more) decks, so let me advice you to contact the artist, that way he will have an idea of how many to print – and I’m under the impression there will be only one print run…. (so the more interested, the more printed & the more affordable it will become, simple laws of economics), afterwards it’s too late to say there were not enough available…. Sadly for collectors and all other kind of lovers of 'old styled' tarots the original hand-made edition is now OOP (one can not start to wonder how long it will take before these will pop-up on eBay and other similar sites at at least double the price they originally went for...). This 'industrial edition' is more resistant and can be handled without taking special care and are up for a good shuffling. The cards are a bit smaller than the hand-made edition (at 6cm x 4cm), yet the images themselves are approximately the same size because the resizing is mainly a result from cropping the formerly impressive white borders (that fitted the original, hand-crafted very well, giving them the look of 22 individual works of art). You can get it directly from the artists on-line shop. A project that has been in the making for many many years has finally come to it's conclusion, a 78 cards deck in Robert place's style and filled with alchemical and mystic links and can be viewed as his masterpiece, a synthesis of all his knowledge and the artistic style he has gained over the years. Robert has become over the years an 'household-name' with a well deserved positive reputation and who has fathered quite some decks with very varied subjects (Tarot of the Saints, Angels Tarot, Buddha Taro & Vampire Tarot) but executed in a immediately identifiable style. For this deck besides his own knowledge and craftsmanship he took inspiration from the Pre-Raphaelite painter Edward Burne-Jones, who in his turn was inspired by the paintings of Botticelli and Michelangelo, rolling back into time towards a mythical golden age of mystique and mystery so to speak and towards the cradle of the tarot. 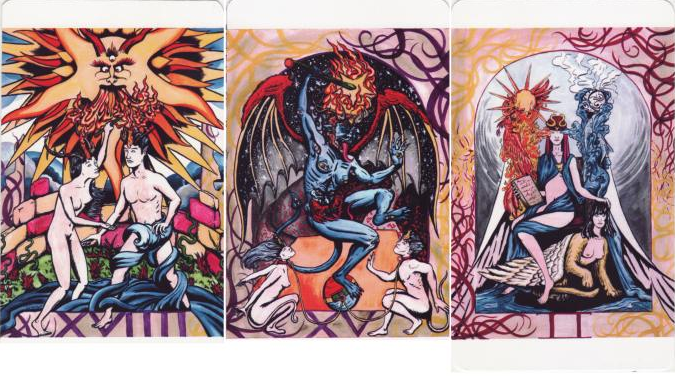 Back in 2009 Robert already published a major’s only version of this deck under the title ‘Annotated Tarot of the Sevenfold Mystery‘ showcasing a larger size version of the cards at 8½" by 5½". That ‘deck’ was not intended for divination but showcases the Neoplatonic mysticism and symbolism expressed in Robert’s tarot, his magnum opus so to speak. Each one of these prints brought together the words and images that make up each individual archetypal power, so to form a magical unity in one print, to meditate upon and study from. Robert is now wanting to self-publishing the finally finished 78-cards version of his latest deck, the 'Tarot of the Sevenfold Mystery' (isn't that a wonderful name that holds a promise of great discoveries and wonder), as he did with the third edition of the deck that made him famous in the tarot-world the 'Alchemical Tarot' and to do so has turned towards Indiegogo to raise the needed funds.You can find the page here with all information and funding options.